What a great shot. Beautiful sky. Yes, you were definitely in the right place at the right time, Andy! Yes, right time and place... that chopper looks like a monster mosquito against that sun. And when did you start this blog, Andy? Fantastic capture, Andy! What a glorious way to end a day! Love the path of light on the water and the helicopter! Terrific! Hope you have a great weekend! Andy...There are certainly a lot of you fine photographers up there in Canada...and I am beginning to think you all the prettiest sunsets in this part of the world. This oranges in this one are so stunning. They definitely pull you right into the photo. Great work. Would you come and see my Sky Watch entry? Thanks a lot! Wow - wonderful shot with the chopper against those rich colours! ah, you are playing with us, switching from one blog to another...! Love this shot. the reflection on the water is exquisite. Oh this is so pretty!! 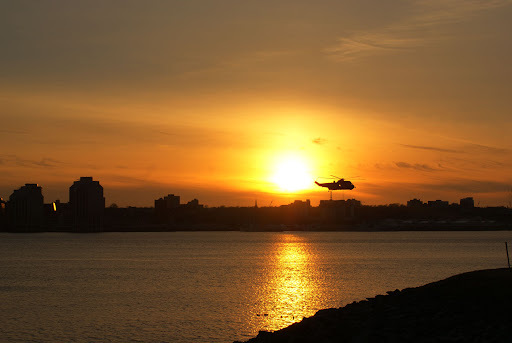 Love how the sunset and the helicopter make the difference! such a beautiful reflection of light upon the water!